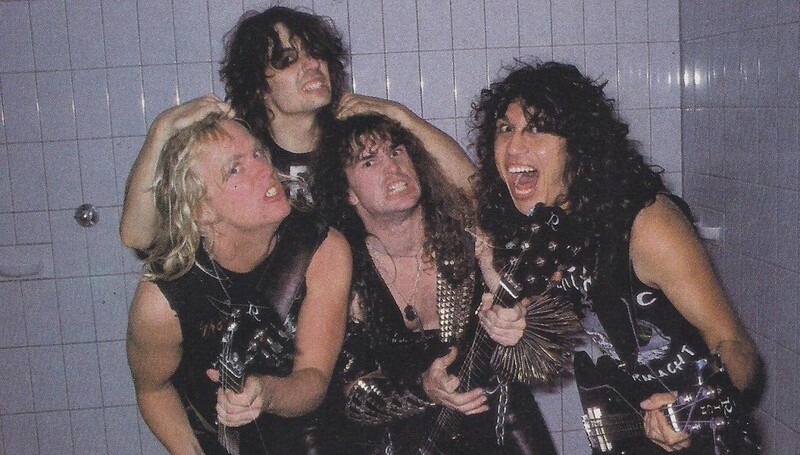 “Hell Awaits” was one of two Slayer records released on the then-new label Metal Blade Records, which was formed only a mere three years prior in 1982. Whereas “Show No Mercy” was financed by the band themselves (through funds accumulated by Tom Araya’s dayjob as a respiratory therapist, and a loan from Kerry King’s father), this second full length was financed by Brian Slagel and his upstart label. Not only did Slagel co-produce the record, but he also brought in a number of respected engineers and producers to allow a more professional production. Recording took place at Eldorado Recording Studios in Burbank, California and the young Slayer had the change to work with the likes of Bernie Grundman, Eddy Schreyer and Bill Metoyer. This album is the second of three Slayer albums that were hugely influential on the nascent death metal scene, although “Hell Awaits” is notable for its Mercyful Fate influence with its longer songs that are dynamically richer than the straightforward cuts of its infamous debut. On its second album American thrashers Slayer came into its own musically and conceptually. “Hell Awaits” is the band’s darkest and most ominous sounding record, and together with Possessed’s “Seven Churches” it laid much of the groundwork for what would later be called death metal. Not only that, Slayer would continue to redefine this then-emergent genre with the successor to this record, the unanimously savage “Reign In Blood”. On “Hell Awaits” Slayer played much heavier and slower than on its debut, but the songs and the subject matter is the grimmest they had penned. Despite being only 7 songs long “Hell Awaits” packs a lot of punch, and while there were faster alternatives available in the scene, it is testament to the band’s substantial growth as songwriters and musicians. On this album the real Slayer sound starts to surface, and the foundation for their later, more universally recognized albums is first laid out here. The album opens with the title track, and unlike the preceding “Show No Mercy” there’s a considerable build-up towards the actual song. Guitar noise, bestial screams, a martial drumbeat and the inverted “join us!” chants last for about a minute before the chants end with “welcome back!” Dave Lombardo kicks in with his drums and the instantly memorable opening riff introduces the now much loved song, which remains a live staple. Much in tradition of Cliff Burton era Metallica the intro serves to set up the rest of the song, and every single member gets his moment in the spotlight. As with any of the early Slayer records vocalist Tom Araya’s bass guitar can actually be clearly heard, and it is responsible for much of the inherent heaviness along with Dave Lombardo’s drums. Besides the fast, multisyllabic, one-breath diatribes that Araya spits out there are one or two instances where his vocals are deformed due to studio effects. It is probably here that the eventual death grunt vocal style took root, along with other early American practictioners of the form such as Jeff Becerra (Possessed), Kam Lee (Massacre), Donald Crotsley (Nunslaughter), King Fowley (Deceased) and Chuck Schuldiner (Death, Mantas). The opening section to ‘Kill Again’ is absolutely monstrous and the lyrical themes fit Slayer as a glove. What initially appears to be a vampyric themed outing turns out to be a serial killer tale, but this band never let a tasty subject slip them by. Thus they deliver a one-two punch with following up ‘Kill Again’ by the slow grinder ‘At Dawn They Sleep’, the band’s take on vampyrism. Interesting is also that ‘Kill Again’ contains one falsetto scream courtesy of Araya, which featured more prominently on the band’s debut but seemed to disappear more with each consecutive release after this one. Araya goes completely off the rails towards the end of the track, which adds greatly to the adrenaline-fueled intensity. As expected the off-the-wall delivery completely sells the track and its, at the time, shocking subject matter of serial killing described in gruesome detail. By the same token the slow churning of ‘At Dawn They Sleep’ greatly benefits from a truly macabre atmosphere, especially during the dirgey ‘beware! Beware!’ section where demonic voices start to call out to the listener towards the middle of the track. Notable is also that Araya’s bass lines are actually more interesting than the riffs of the hallowed duo that were Jeff Hanneman and Kerry King. The last third of this song is especially interesting as it shows off Dave Lombardo’s dexterity behind the drumkit and it actually sets up the next track in terms of speed and intensity. ‘Praise Of Death’ is the fastest song on the album, and probably also the band’s heaviest track to date. It is a proto-death metal song in more ways than it initially suggests, and it is the sole writing credit for Kerry King on his record. 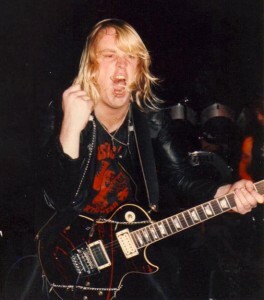 Most tracks were co-written by Hanneman and King. In terms of construction it formed much of the basis for the much shorter cuts of the successor to this album “Reign In Blood”, although that album would reduce the songs to its essentials. ‘Necrophiliac’ deals with the lovely theme of corpse molestation, and ‘Crypts Of Eternity’ is another horror themed song that pretty much covers the plot of Lucio Fulci’s 1980 splatter classic “The Gates Of Hell”. ‘Hardening Of the Arteries’ is mostly remembered because it reprises the opening section of ‘Hell Awaits’ shortly after the two-minute mark. This was the only time that Slayer bookended a record with almost exactly the same melodies and riffs. The reprise ends in guitar noise and only serves to mask the fact that this song is barely over two minutes long. “Hell Awaits” has Slayer at its most musical and ambitious. The album is dynamically and compositionally richer than the album before or after it. 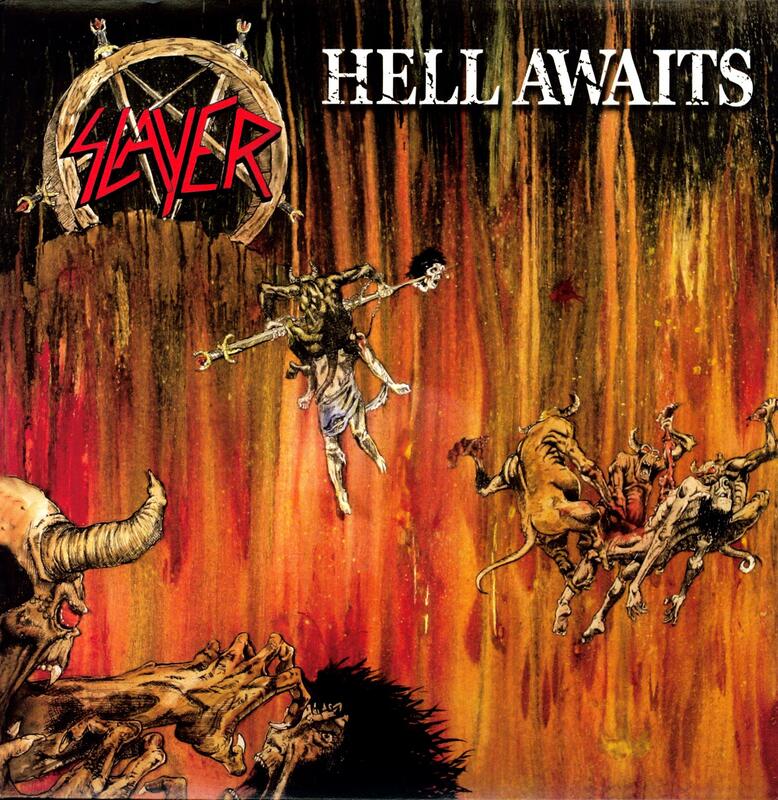 While slower compared to the band’s off-the-rails debut, and the wall-to-wall extremity of its successor, “Hell Awaits” is the only album of its kind in the Slayer canon. Dark, depressive and utterly frightening it is an unrelenting exercise in pacing and overall heaviness that the band was never able to replicate. Like Metallica’s “Ride the Lightning” or Sepultura’s “Schizophrenia” it marks an undeniable surge in instrumental skill, more complex and involving songwriting and a keen understanding of what makes its lyrical concept work. Horribly dated by today’s standards, and a bit goofy in retrospect “Hell Awaits” was nevertheless an important cornerstone for the emerging death metal sound that was being formulated in the mid-to-late 1980’s by bands in Europe and the US. Slayer’s name will forever be etched in the annals of extreme music history for that reason.